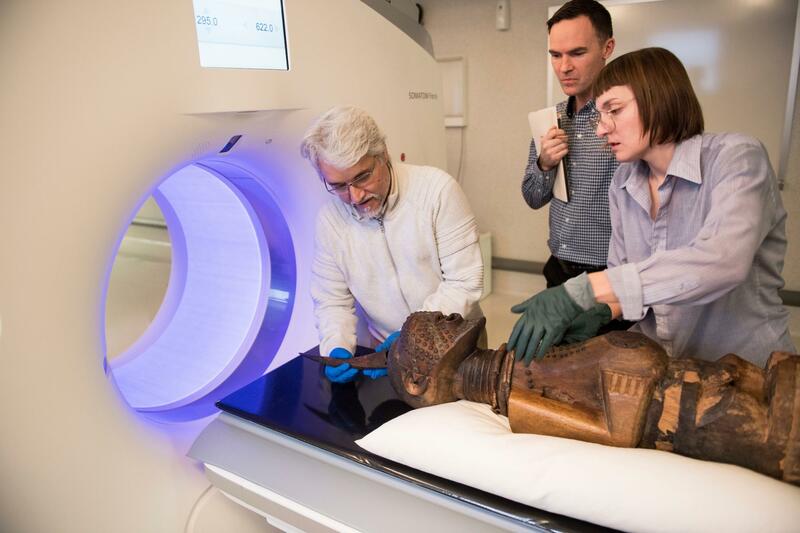 Thanks to imaging technology, museum staff at the University of Iowa Stanley Museum of Art have a better idea of what might be inside 16 of the museum's works of African art—without having to break them open. The works, which were analyzed by a computed tomography (CT) scanner in January at the University of Iowa Hospitals & Clinics, are power objects that date from the late 19th century to mid-20th century and are made from materials such as wood, clay, metal, horn, and animal skin. However, that's just what can be seen by the naked eye. What's hidden inside the objects truly gives them their importance. 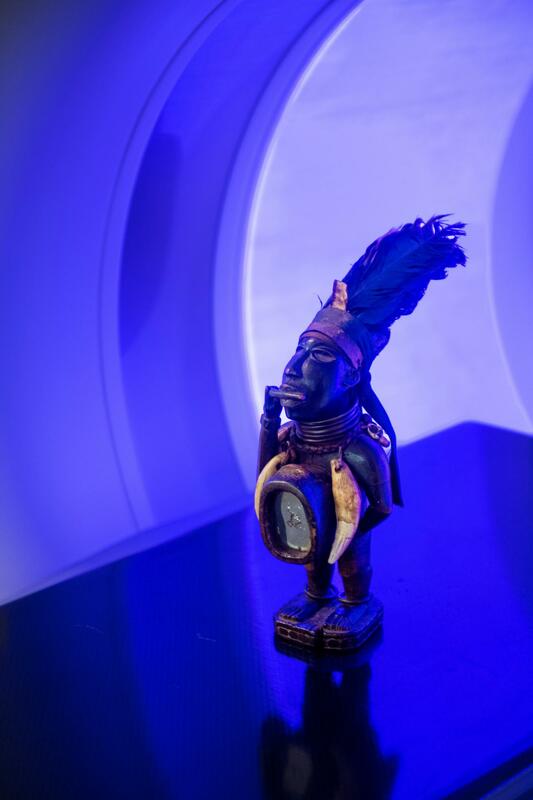 The sculptures contain cavities into which substances empowered by a diviner were placed. The scans were done on the Siemens Somatom Force CT scanner, which was installed in the University of Iowa Hospitals & Clinics' Advanced Pulmonary Physiomic Imaging Laboratory (APPIL) in 2015. It's a dual-energy scanner, which means it can scan and produce images of an object at two energy levels. "That allows us to visualize different materials based on those energy levels," says Melissa Saylor, a CT research associate in the lab. "It's great for something like this because we didn't know what types of materials were inside." The scanner also uses metal artifact reduction, which reduces streaking that can occur from metal objects and allows for better detail. This was beneficial as some of the art contained metal pieces, such as nails. The Selection Committee for the 2018 Alton Ochsner Award Relating Tobacco Smoking and Diseases is pleased to present its 33rd Annual Award to Professor Geoffrey T. Fong, Ph.D. Professor of Psychology and public Health Systems, University of Waterloo, Waterloo, Canada, and to Eric A. Hoffman, Ph.D., Professor of Radiology, Medicine, and Biomedical Engineering, University of Iowa School of Medicine, Iowa City, Iowa. Both scientists independently have made major contributions that will significantly impact their areas of research through their work and the training of other investigators. Their work related the effects of prolonged consumption of tobacco smoke on the development of malignant disease in patients. Each awardee will receive a $7,500.00 honorarium, an award medallion, and a plaque with the identifying statement attributing their research findings. Doctor Fong, Senior Investigator of the Ontario Institute for Cancer Research and Principal Investigator of the International Tobacco Control Policy Evaluation (ITC Project) Waterloo, Canada, is an incredible role model and mentor for his colleagues of the ITC Project and created a network of over 150 tobacco control investigators globally. In brief, Doctor Fong's broad ITC Research Project conducted longitudinal nationally representative surveys assessing all major dimensions of tobacco use and control policies in 28 countries, covering over one-half of the world's population and over 70% of the world's tobacco users; they also cover a broad mix of low, middle, and high income countries across every continent. Doctor Fong's team of tobacco control researchers have provided evidence-based action globally to combat the number one preventable cause of death and disease in the world. Doctor Hoffman is Professor of Radiology, Medicine, and Biomedical Engineering at the University of Iowa Carver College of Medicine. He is Director of the Advanced Pulmonary Physiomic Imaging Laboratory (APPIL) of the Department of Radiology. Doctor Hoffman's pioneering efforts to develop CT imaging as a quantitative tool for the assessment of structure-to-function relationships in the lung has led to his laboratory serving as the imaging center for numerous large multi-center studies focused on chronic obstructive pulmonary disease (COPD). 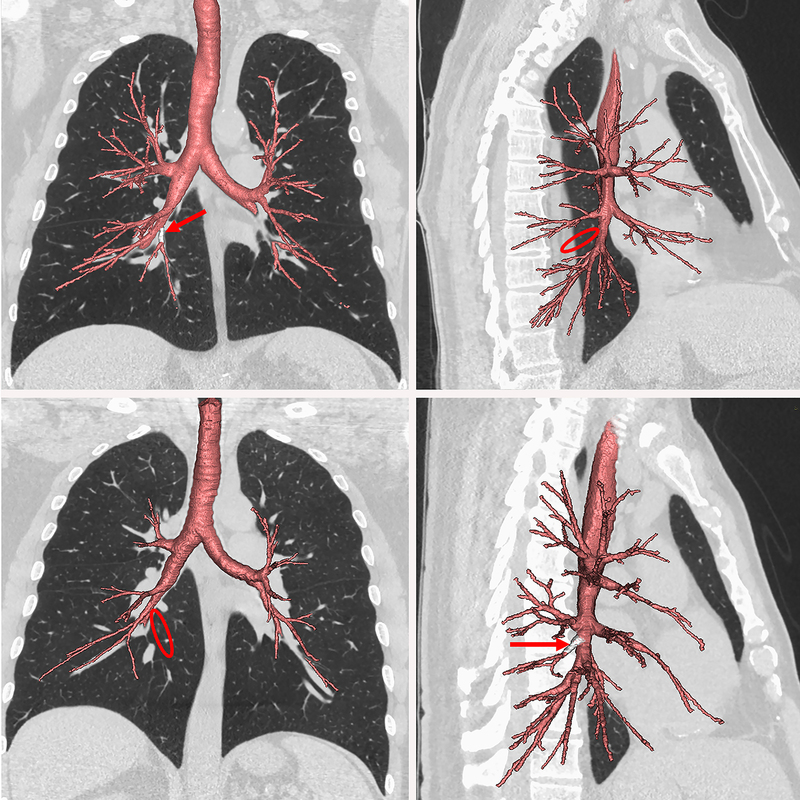 Imaging methods and image analysis software developed in his laboratory have provided novel phenotypes of smoking associated lung pathology and have contributed to a growing body of highly convincing data used to understand smoking associated disease etiology and disease progression. Utilizing multi-spectral, dual energy CT to image an index of regional pulmonary perfusion, he demonstrated that the vascular response to micro-inflammatory events likely serves amongst the earliest events leading to smoking-related lung disease and may predict risk for development and progression of COPD, thus illuminating pathways for diagnosis, treatment and outcomes assessment. A UI study shows genetic variation in lung anatomy may be a cause of COPD. Researchers are working to learn more about factors other than smoking that increase a person's risk for developing chronic obstructive pulmonary disease. "The study was funded by the NIH to identify markers of various sorts that will break down the population of smokers that get COPD, and break them down in subgroups with the idea to find interventions," said Professor Eric Hoffman, the director of the UI Advanced Pulmonary Physiomic Imaging Laboratory. "If there is a trait that is differentiating, and changing quickly, you don't have to study them for 10 years," Hoffman said. "You can study them for a short period of time." A study involving University of Iowa Health Care lung imaging experts suggests that common, inheritable variations in lung anatomy might increase the risk of developing chronic obstructive pulmonary disease (COPD). A UI team led by Eric Hoffman, PhD, headed the radiology portion of the research. The team developed imaging protocols, oversaw imaging and quality control, and provided the quantitative analysis of the images via a UI-derived company, VIDA Diagnostics. Researchers at Columbia University combined the UI data on lung anatomy and function with other clinical and demographic data associated with each participant. 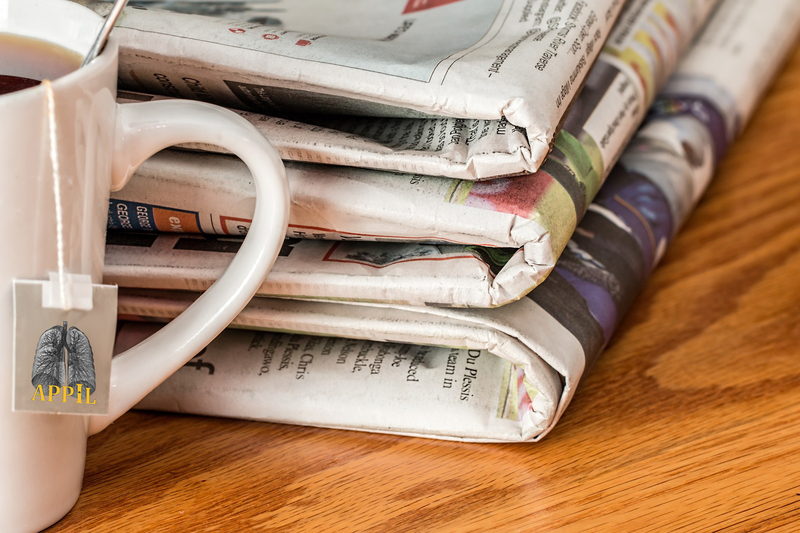 The results of the study were published in the Early Edition of PNAS the week of Jan. 15. Upper panel is a ventral-dorsal view of the airway tree showing the most common (~75%) human airway configuration in the upper panels. Presence of a right medial basal airway segment (upper left panel) is missing in variant 1 shown in the right lower panel. The right lateral view of the standard airway tree seen in the upper right panel demonstrates a missing right accessory sub-superoir airway segment seen in variant 2 as displayed in the right lower panel. Variant 1 is present in 6.1% of the population and in 31% of siblings with the variant and carry a 1.78X greater chance of COPD in smokers. Variant 2 is present in 16% of the population and 46% of siblings and imparts a 1.4X greater chance of COPD regardless of whether one smokes or not. The Advanced Pulmonary Physiomic Imaging Laboratory, within the Department of Radiology at the University of Iowa’s Carver College of Medicine, directed by Dr. Eric Hoffman PhD, has served as the radiology center for a growing number of national and international multi-center studies for which lung imaging was a major component of the protocol. As such, more than 40,000 data sets have been sent to the laboratory for quality assessment and quantification. 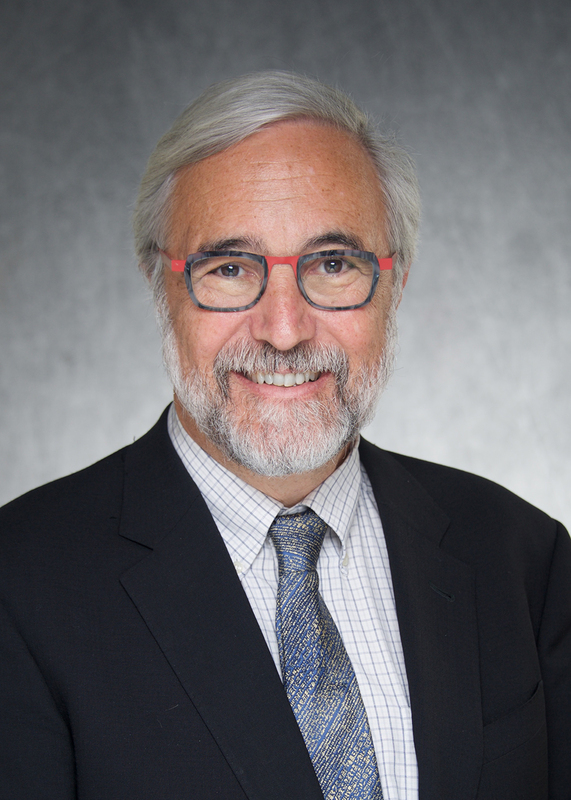 Hoffman and his research group has worked on lung imaging methods for nearly 40 years and he has led lung imaging research at the UI for 24 of those years. Standard pulmonary function testing has lumped many diseases into single entities and masked the presence of others. Imaging is allowing physicians to identify disease processes early and differentiate the processes, and thus is providing the hopes for better, earlier in the treatment of disease before the disease brings patients to the late stages of debilitation. In addition to overseeing imaging in multi-center studies, the CT research facility within APPIL has served to image over a thousand smokers participating in the National Lung Screening Trial leading to the recommendation that a group of high risk smokers be screened by CT annually to reduce cancer deaths in this population. The research CT facility has also been utilized to image an additional 1,000+ subjects in the COPDGene study seeking to identify imaging-based phenotypes within the COPD population with the goal of identifying genetic linkage to the subgroups of patients with this smoking associated lung disease. A five-year renewal lets a national study move to the next phase and complete its 10-year follow-eups. Iowans have had the highest subject retention in a national study aimed to learn more about COPD, a group of lung diseases that make it difficult to breathe. The National Institutes of Health funded study the University of Iowa has participated in called COPDGene has been given a five-year renewal. The purpose of this study is to find out why some people develop COPD and others do not. The five years will be used to complete its 10-year follow-up with its 10,000-participant cohort. The study was launched in February 2008 with Geoffrey McLennan as the principal investigator; Alejandro Comellas took over when McLennan died. Eric Hoffman, who has collaborated with Comellas on the study with imaging, said McLennan is one of the main reasons that the University of Iowa study center has the highest participation and retention rate. "He just very aggressively recruited patients into the study," Hoffman said. "He would go to dog races and on intermissions go on the intercom and try to recruit patients; he would make deals with mayors of small cities in Iowa to get the whole city to volunteer, to participate; so in the end, out of 10,000 subjects in COPDGene, 1,300 of them were Iowans." The retention rate for the University of Iowa center is close to 100 percent, which puts it ahead of all the other 20 sites around the country and exceeds the national standard for a longitudinal study. Research coordinator Kimberly Sprenger said in a sub-study that was conducted in 2007 to find the reason Midwesterners had such high participation rates in studies, they found that it was because they wanted to help their other people. "This is a very serious disease, and people with it want to help their fellow mankind find a treatment and a cure, so they want to do something good from a terrible disease," she said. With the renewal, the follow-ups will continue to conduct the same tests that have already occurred, such as CT scans of the lungs, blood tests, and questionnaires about daily life, so the researchers can go back and compare the new data from the data collected five years ago. "They've been baseline imaged at five years; now, they'll be imaged at 10 years, so people will be able to look backwards at what their images looked like five years ago, and see if anything in the images would lead us at an earlier stage to know who's going to evolve into which form of the disease," Hoffman said. So far, the researchers have found that there are certain genes associated with COPD, and that it's more than just one disease, there are actually several forms of COPD, such as emphysema and certain airway characteristics that inhibit breathing, Comellas said. They will use these findings to try to lead to earlier diagnosis and treatment. "The goal is to learn more about the genetic makeup of COPD, and once you learn the genetic makeup, then that can lead to better diagnosis and treatment," Sprenger said. In a finding that could lead to better treatment of smoking-related lung diseases, a group of scientists from institutions across the country, including the University of Iowa, is reporting that about half of current or former smokers have respiratory symptoms similar to COPD and an increased risk for exacerbations or "flare ups" of their symptoms despite normal lung function and a lack of COPD diagnosis. Many of these individuals show COPD-like symptoms, such as shortness of breath and difficulty exercising. They also have a high rate of respiratory medication use despite a lack of data from clinical trials about appropriate treatment of this particular patient population, the researchers note. In addition to raising the question of whether the definition of COPD should be adjusted, the researchers say that the study highlights a large, understudied patient population who might nevertheless benefit from early treatment intervention. Their study, published May 11 in the New England Journal of Medicine, was funded by both the National Heart, Lung, and Blood Institute (NHLBI) and the Foundation for the National Institutes of Health (FNIH). COPD, or chronic obstructive pulmonary disease, is the third leading cause of death in the United States. It is a progressive lung disease that makes it hard to breathe. Cigarette smoking is the leading cause of COPD. While researchers estimate that millions of Americans have COPD, many have the disease and do not know it. The condition is currently diagnosed using spirometry, a test that measures how much air you breathe out and how fast. Researchers have long observed that some current and former smokers appear to have respiratory symptoms associated with COPD such as coughing and shortness of breath despite having a normal spirometry test. However, the extent and clinical implications of this problem were unknown until now. For the current study, the research team led by scientists at several institutions, including the University of California at San Francisco and the University of Michigan, conducted an observational study called SPIROMICS (Subpopulations and Intermediate Outcome Measures in COPD Study). It includes patient data collected between 2010 and 2015. The scientists examined respiratory symptoms and measured lung function with spirometry among 2,736 participants -- current or former smokers, aged between 40 and 80 years old, as well as controls who had never smoked. They found that respiratory symptoms were present in about half of the current or former smokers despite normal spirometry readings. Participants who had respiratory symptoms despite normal spirometry had an increased rate of exacerbations or "flare ups" of their symptoms. Using computed tomographic (CT) imaging scans of the lung, overseen by the SPIROMICS Radiology Center at the University of Iowa and analyzed at the VIDA Diagnostics Core Lab in the Bioventures Center of the University of Iowa, the researchers also found a high incidence of thickening of the airways, a sign of lung disease. "These findings demonstrate that there is a large group of smokers who have COPD symptoms including associated flare-ups who have gone unclassified because of the reliance on pulmonary (lung) function tests. The study shows that quantitative CT scans can provide insights into underlying lung disease processes, and suggests that lung function tests should not necessarily serve as the only test for diagnosing COPD and guiding treatment," says Eric Hoffman, PhD, director of the Advanced Pulmonary Physiomic Imaging Laboratory (APPIL) within the UI Health Care Department of Radiology, and home to the SPIROMICS Radiology Center. Hoffman says the CT scans were important in this study because the scans were able to detect lung abnormalities even when standard pulmonary function tests were normal. Additionally, the scans helped differentiate between airway disease - the airway wall thickening - and emphysema. Hoffman says CT may provide a mechanism for following disease progression in addition to identifying targets for treatment. CT imaging may also be useful for assessing outcomes associated with interventions. Woodruff PG, Barr RG, Bleecker E, Christenson SA, Couper D, Curtis JL, Gouskova NA, Hansel NN, Hoffman EA, Kanner RE, Kleerup E, Lazarus SC, Martinez FJ, Paine R 3rd, Rennard S, Tashkin DP, Han MK; SPIROMICS Research Group. Clinical Significance of Symptoms in Smokers with Preserved Pulmonary Function. N Engl J Med. 2016 May 12;374(19):1811-1821. PubMed PMID: 27168432. Advanced Pulmonary Physiomic Imaging Laboratory, or APPIL for short, seeks to broaden the understanding of basic physiology and pathophysiology of the lung along with pulmonary disease co-morbidities using quantitative imaging. APPIL also strives to rapidly use emerging insights for the translation of new image-based methodologies into tools that are applicable to the broader research community and clinical practice for the improved diagnosis, phenotyping, and treatment of lung disease. Under the direction of Dr. Eric Hoffman within the Department of Radiology, APPIL is a lung imaging, research-based laboratory within I-CLIC and is founded upon more than 30 years of continuous funding. Both Dr. Hoffman and Dr. Newell (Radiologist and APPIL Director of Translational Research) are members of the Fleischner Society in recognition of their significant contributions to quantitative lung imaging dating back to the very beginning of x-ray computed tomography. Early studies served to validate CT as a tool for assessing lung volume, regional air content, regional lung expansion, airway segmentation and vessel segmentation. These works were focused upon the use of purpose built, one- of-a kind scanner systems (the Dynamic Spatial Reconstructor) and the electron beam CT scanner. 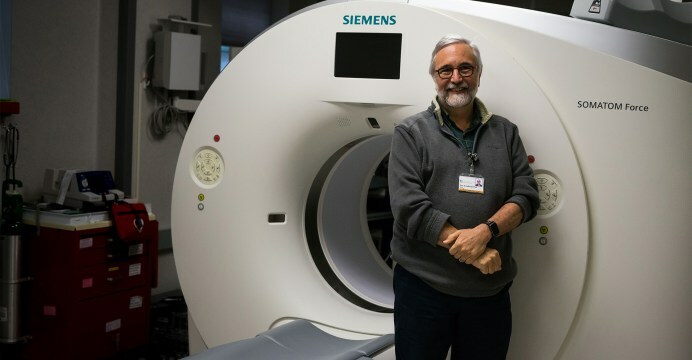 With the emergence of multidetector-row CT scanners, the group was awarded a 5 year, $10M Bioengineering Research Partnership (successfully renewed for the maximum 10 years of total funding) by the NIH to establish MDCT as a comprehensive imaging modality to assess the structure and function of the human lung, establishing normal ranges of airway and parenchymal metrics along with regional characteristics of ventilation and perfusion assessed via dynamic axial CT imaging. Furthermore, APPIL serves as the Radiology Center for a number of NIH sponsored multi-center studies seeking to utilize imaging as a biomarker for assessing pathology and predicting outcomes. Studies include the National Emphysema Treatment Trial (NETT), the Severe Asthma Research Program (SARP), MESA- Lung, COPDGene, and more recently our lab serves as the Radiology Center for the NIH sponsored "SubPopulations and InteRemediate Outcome Measures in COPD Study" (SPIROMICS). A Bioengineering Research Partnership Grant serves as the current flagship of the lung imaging efforts. In this recently funded BRP (Hoffman, PI), investigators seek to establish protocols for functional dual energy computed tomographic imaging (taking advantage of multi-spectral CT capabilities to simplify protocols for integration into multi-center trials), to link CT phenotypes to quantitative measures of lung inflammation, in order to evolve lung modeling tools so that they can be applied to larger population studies and to provide tools for multi-center quality control. While x-ray computed tomography (CT) is providing quantitative maps of lung destruction and airway remodeling, these anatomic markers may be insufficient to identify initial causal factors of emphysema that can drive new effective therapeutic interventions. The APPIL group has recently focused on the use of both dual energy CT (DECT) to assess indices of regional pulmonary blood flow (PBF) and single photon emission computed tomography (SPECT) to assess pulmonary inflammation in order to better define the mechanisms that lead to a smoking-associated COPD phenotype. Recent findings, published in the Preceedings of the National Academy of Science, have suggested that CT derived regional PBF parameters within inflamed lung parenchymal destruction in a subset of smokers susceptible to centrilobular emphysema. It is thought that the inability to maintain perfusion to inflamed lung regions may form the basis for a broad spectrum of inflammatory lung disorders. As a member of the Iowa Institute for Biomedical Imaging, the Iowa Comprehensive Lung Imaging Center represents a group of loosely knit collaborators who have joined together with a common interest in the use of quantitative imaging techniques to better understand the normal lung and the permutations leading to and defining pathologic states. Each member of this group is well recognized in their own right and their backgrounds are diverse, including Physiology, Medicine, Radiology, Anaesthesiology, Mathematics, Electrical Engineering, Biomedical Engineering, and more. While each of these individuals run successful laboratories, there is a clear need for a dedicated imaging center, which serves as a gathering place and provides these individuals access to state-of-the-art facilities in which to accomplish their research. This site provides a means of interacting with and influencing industrial partners in regards to the future directions of imaging technologies, and it provides a synergy serving to rapidly advance both the field of lung imaging and our understanding of the lung. 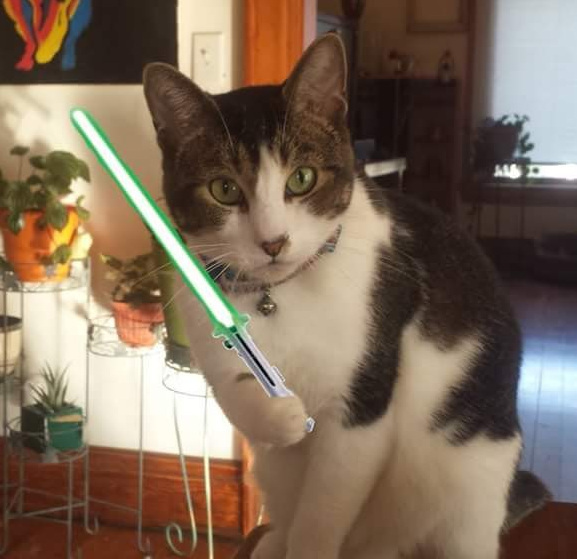 While primarily focusing on advanced CT imaging, areas of interest have also expanded to MRI and PET. 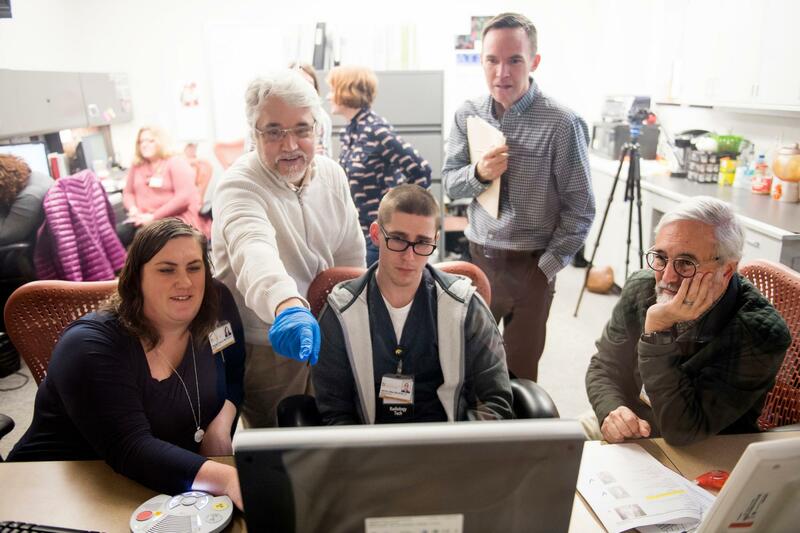 The mission of Iowa Institute for Biomedical Imaging is to foster efficient and cooperative interdisciplinary and cross-college research and discovery in biomedical imaging, and to improve training and education within the broader community at the University of Iowa. One of several teams of investigators that is currently housed in the recently constructed Pappajohn Biomedical Discovery Building, the IIBI was formed in 2007 as an acknowledgement of a long history of interdisciplinary collaboration at the University of Iowa. The formation of the interdisciplinary institute reflects a strong institutional support to biomedical imaging and image analysis as well as translational medical research. The IIBI brings together more than 40 faculty members (out of which over 25 hold faculty positions in the Carver College of Medicine, 15 hold faculty positions in the college of Engineering with a primary expertise in biomedical image analysis) and over 60 graduate students and postdoctoral fellows.